A genre-blending mix of country, rock and jazz that combines pop hooks, unusual lyrics and stellar musicianship for an album perfectly suited to zooming down the freeway on a Sunday afternoon. 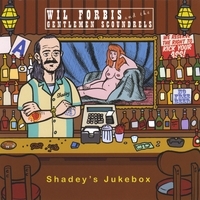 Drop a quarter into the antique Wurlitzer in an off the beaten path honky-tonk, then sit back while the whimsical, dynamic and always musical songs from Wil Forbis and The Gentleman Scoundrels debut album "Shady's Jukebox" fill the air. It's a collection of music that may seem ambitious; after all, it flirts with a wide variety of styles and genres. "Shady's Jukebox" is rooted in country music --- as exemplified by the opener "Let's Get High on Jesus" --- but it's an album with musical muscles that are eager to stretch. Dixieland horn breaks, hillbilly bebop instrumentals and traditional bluegrass will tickle the ears of listeners used to the straight and narrow. What prevents the album from ever becoming a mere sampler platter of diverse but ultimately unsatisfying appetizers is Forbis's allegiance to the craft of songwriting. "Shadey's Jukebox" contains a gamut of radio ready hooks. Legendary Lazy Cowgirls front man Pat Todd remarked on two of the album's catchier cuts, stating, "The Better Man Won" b/w "How Am I Supposed to Feel" could have been one of those great, out of left field hit singles on AM radio circa 1970-72." The well-crafted songs are complemented with sterling musicianship. Muscular guitar playing abounds. Dave Alvin sidemen Steve Mugalian pounds out unrelenting grooves on the drums. Prominent guest musicians from the Los Angeles alt-country scene spice things up with fiddle, pedal steel and percussion. Atop the music, Forbis stamps a unique lyrical identity. He avoids not only the cliché ridden pablum that dominates much of the "Hot Country" market but the overdone angst of alt-country crooners who seem too intent on crying into their whiskey. Forbis is willing to wear his heartache on his sleeve, but he's also not afraid to boast, to fantasize and to use humor to find the sweet spots in life. Even a melancholy tune like the album closer "Old Before My Time" contains appropriate amounts of optimism and whimsy. All the ingredients are in place for an album that demands repeated listens.